SRH post 181/3 in their stipulated 20 overs. KKR need 182 to win. 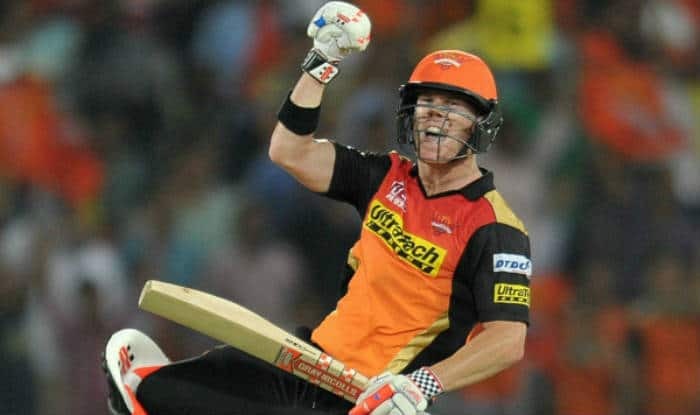 IPL 2019: David Warner missed out on a hundred as he was dismissed for a breathtaking 53-ball 85, but he ensured Sunrisers Hyderabad get to a handsome first inning total against Kolkata at Eden Gardens. Warner making a comeback to Indian T20 League showed no signs of scratchiness as he looked in sublime touch hitting boundaries at will and clearing the ground with utmost ease. While on fifty, he also became the first player to slam 40 scores in excess of 50. He is followed by Kohli (39) and G Gambhir/ S Raina (36 ). Warner’s breathtaking knock was laced with nine fours and three sixes. He also went past Rohit Sharma (757) and Suresh Raina (745) to register most runs against Knight Riders in IPL history. Meanwhile, Kolkata won the toss and opted to field first. SRH got off to a flyer as the openers put on 112 runs in 12 overs before losing the first wicket. Warner, making a comeback looked in sublime touch as he stroked a belligerent 85 off 53 balls. At the time of filing the copy, SRH has posted 181/3 in 20 overs.